Jump quickly into a fascinating and unique horror rpg, but don’t plan on having a campaign. Great horror role-playing that isn’t Call of Cthulhu. Find Dont Rest Your Head on Amazon. In Don’t Rest Your Head, you are an insomniac that is pushed to the point where you can enter a nightmare world, interact with others like yourself – the Awakened – or interact with creatures of nightmare in the Mac City. You have some personal goal to achieve, and can use your exhaustion power (a normal skill for which you have an almost supernatural talent to do right) and madness power (something way out there and crazy) to reach that end. Reading between the lines, the author clearly wanted to create a type of Dark City role playing game, based on the David Goyer film. The base back story is rich and unique, and the base mechanics are strongly tailored to support the back story. The uniqueness isn’t hard to grasp either as the normal world is simply the real world. The one disappointment I have with the premise is that the Mad City really isn’t as cool as it could be. There are checks and balances in the Mad City which are a little too clever and word playful – for example a bad guy called the Tacks Man – his head is a huge pushpin. If the background was more like the movie Dark City, Premise rating would be 5.5. Even though you do have statistics, the game focuses more on your motivation – why you are an Awakened, what your life was like before and what drives you now. A mechanic for finding background connections to a player next to you helps to rapidly give your party a reason to work together. Character creation is very fast! The only let down is that it is so lean that there isn’t much to say about your character in the real world. It is one of the few games that you can give your players character sheets, read off questions and then be ready to play in 10 minutes. Don’t Rest Your Head relies on six-sided dice: a lot of them. During each conflict, you may roll dice for: discipline, madness and exhaustion, whereas the game master has one set of dice: pain. A 1,2 or 3 is a success. The highest roll between you and the game master dominates – that means you can either stay cool and under control (discipline), go a little crazy (madness) or increase your exhaustion. If your madness or exhaustion get too high, you either go totally bonkers and become a nightmare, or crash – otherwise fall asleep. Falling asleep is bad, because you are vulnerable to nightmares. The dice mechanic is lean, but the types of dice, how they work together and how a single roll of a handful of dice can resolve many elements of interaction provide for a unique experience. That said, Don’t Rest Your Head doesn’t really have a good mechanic for action in the real world. The book does have rules summaries that are very clear and will save you a lot of page flipping. Sure, its a small game – but this, plus the index and good use of bold text shows how usable it is. Characters can improve by gaining scars. You can trade your scars for changing your powers, or temporarily use them for rerolls. This is the least interesting part of the game. Sure, going crazy and becoming an NPC doesn’t seem all that different than joining the darkside in West End Game’s Star Wars, or going bonkers in Call of Cthulhu after learning too much about the alien universe. The end game can potentially be ugly. However your character does not improve in a wide variety of interesting ways for a sustainable campaign – at least the system isn’t built that way. 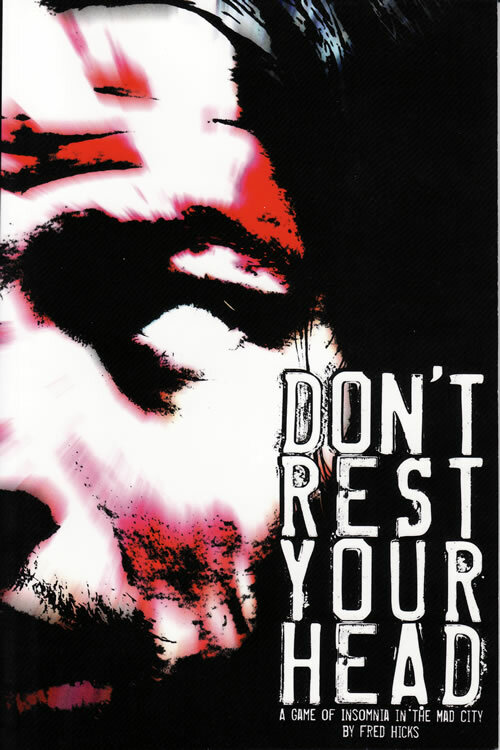 You can get a PDF version of Don’t Rest Your Head, or you can get a print-on-demand, perfect bound 77 page book, costing just around $15. The cover art is in color, interior is black and white. Artwork is heavily Photoshop’d photos. The artwork is neither inspiring or detracting; so much black and white artwork is simply terrible in RPGs, but the amount and style are an overall benefit to this product. This is just one of those few products where it works.